The office night out is a great excuse to get to know other co-workers outside of the office confines. This can be a chance to network and make friends. But the office night out can leave employees regretting their actions the next morning after having one drink too many. Office parties present an opportunity to get know co-workers in an unofficial and relaxed setting. This can be the time to get to know colleagues, their interests and aspects of their home life. Many co-workers have become life long friends simply by sharing their interests and socialising at an office night out. This can also be the perfect time to mix with co-workers from other departments within a company. Getting to know co-workers is the reason that office parties are sometimes held quite soon after new employees start with a company. Some work talk is to be expected during an office night out but don’t let it become the main focus of the evening. Anyone who sits and talks about the new office photocopiers will soon find themselves having very short conversations. Be friendly and open and don’t be afraid to talk about interests and activities outside of working life. This will help co-workers bond and find things in common with each other. Office parties, dinners and nights out can be an opportunity to meet and mingle with employees and managers from other company offices. This can help with career networking and give the employee a chance to be recognised as opposed to simply being a voice on a telephone. If career progression is on the agenda get to know those who can help with a foot up the ladder. There is no need to talk about work all night but take the opportunity to become recognised by those who may be able to help with career opportunities. Some say that office gossip is the life blood of a company; but this is usually said by the office gossip. People love salacious gossip and with the drink flowing at an office party it is very easy to become involved in the rumours. But the temptation to indulge and spread office gossip can have a very bad habit of backfiring. This sort of gossip usually has the habit of ending up in the ears of the person who is being gossiped about. It only takes one malicious co-worker to point a wrong finger about who is spreading the gossip for things take a turn for the worse. Drinking to excess is often, without intention, the norm on an office night out for many people. 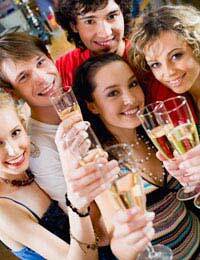 Office Christmas parties especially are places where the drink is flowing freely, sometimes with an open bar. But drink tends to lower inhibitions and can lead to some embarrassing moments. Embarrassing drunk dancing may not be too bad but making a pass at a co-worker or the boss can lead to some regrets. Remember, some co-workers will revel in the sight of an employee making a fool of themselves; and they will usually capture the moment on their mobile phone. Grievances and conflicts between employees are natural but should not be brought out at an office night out. Unfortunately, when drinking is involved on an office night out it is very easy to succumb to the temptation to air a grievance with a work colleague. Things can easily be said that will be regretted once back in the office setting. Even worse, if fights do occur outside of the office setting between employees it could lead to disciplinary action. Never, under any circumstances, tell a manager exactly what is wrong with their management skills during an office night out. An office night out is not everyone’s idea of fun. Some see the office night out as ‘forced fun’ where an effort must be made to reassure the boss that the office is one big happy family. This is never usually the case but a night out should at least be a chance to relax, have a few drinks and socialise. Good company can always be found at an office night out; it may just involve the effort of getting to know someone outside of the usual working team. Make the effort to mix and socialise with co-workers, and future office parties can become something to look forward to.